Discover the Aphrodite trail, one of the most beautiful Cyprus walks on the Akamas Peninsula. It's one of my favourites with its stunning views over the blue lagoons. Do it in spring and you will be rewarded with a multitude of wild spring flowers including gorgeous rock cyclamen and the teeniest vetch, star of Bethlehem and multicolored anemones. 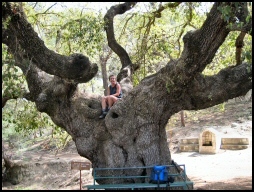 Cyprus has many way-marked nature trails and if you only walk one of them when you visit the island, make it this one. The Aphrodite Trail is probably the most beautiful walk on the island and, unlike Aphrodite's Baths, which is a disappointment to many visitors, this walk will be a lasting reminder of your holiday in Cyprus. It is one of our favourite walks, and I never ever get tired of the stunning views from the highest point on the walk. This way-marked Akamas walk is one of 47 nature trails on the island. 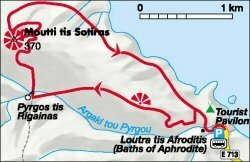 It starts from just above the Baths of Aphrodite and follows the mythical route taken by Aphrodite and her lover Adonis. You will ascend the boulder strewn spine of the Akamas to Aphrodite's sanctuary at Pyrgos tis Regainas (which means Queen's castle), now dominated by a magnificent 860 year old oak tree. Tip: The excellent Rother Cyprus walking guide has 50 detailed trails in both South and North Cyprus and includes maps and timings of the Aphrodite trail and many other of my favourite Cyprus walks. I think it's the best Cyprus walking guide available from many other books on the market. 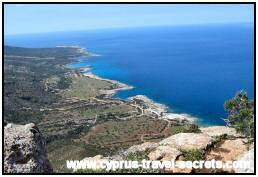 You then climb higher still to the rocky table-top on the Akamas known as Moutti tis Sotiras. 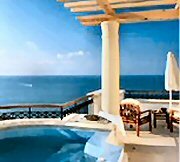 Your hard effort is rewarded with what is surely one of the most breathtaking views on the island, across the blue lagoons to Cape Arnaoutis at the end of the peninsula. Then, surefootedness is required for the steep, switchback descent down the north side of Moutti to the wild shrubland below. Tip: If you don't have a head for heights, do take a walking stick with you as the descent has several switchbacks and there is no barrier to save you if you slip on the gravelly surface! At the bottom of the switchback path you join a stony, vehicle-width track to return to your start point at the Baths. Terrain: A mixture of loose gravel and some larger rocks which require occasional scrambling. Navigation Pointers: Take care at waypoint number 10 which requires a sharp right hand turn, uphill to find it. There is a more obvious path directly ahead but this is where many people (including us when we first walked the trail!) have gone wrong. Further on, at the top of the steep, rocky, initial ascent, you must bear LEFT and slightly downhill to reach the old oak tree. The remainder of the route finding is relatively easy. Tip: If you are scared of heights, you may want to consider doing the walk in reverse as it is easier to ascend Moutti tis Sotiras without really noticing the gradient - you will be too busy breathing hard to worry about how steep the drop is! Alternatively, if you really don't want to do tackle the switchback section, then simply retrace your steps back to Pyrgos tis Regainas and follow the Adonis trail back to the Baths instead. Where to Eat: The restaurant at Aphrodite's Baths is a little touristy but the food is good. Alternatively, head back to the fishing harbour of Latchi for a wide variety of mouthwatering fish delicacies. Better still, take a picnic to eat on the Aphrodite Trail at the top of Moutti tis Sotiras and admire the views.